As a part of the Obama Administration’s effort to cut energy waste in America’s buildings, today the Energy Department launched the Better Buildings Zero Energy Schools Accelerator. Six school districts, two states and several national organizations are working collaboratively to develop zero energy design that is cost-competitive to conventional construction in the education sector and in local communities across the nation. A Zero Energy Building is an energy-efficient building, where on a source energy basis, the actual delivered energy is less than or equal to the onsite renewable exported energy. In conjunction with the launch, Energy Department officials joined other key stakeholders today to tour Discovery Elementary School, a Zero Energy school located near the nation’s capital in Arlington, Virginia, which officially opened its doors in September 2015. Discovery’s engineering team expects to offset its energy usage with renewable energy and to potentially save about $75,000 within its first year of operation. 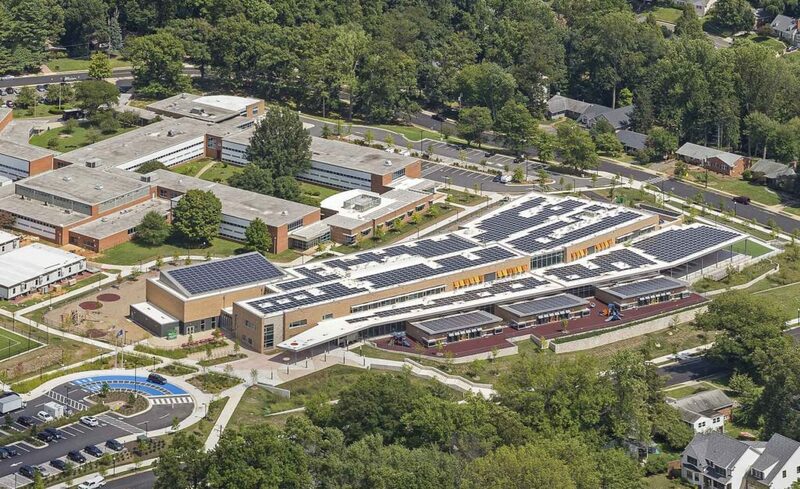 Discovery Elementary is one of 40 emerging Zero Energy ready schools in the U.S., and was built with advanced next generation energy efficiency and renewable power features, including solar rooftop and geothermal heating and cooling systems. Click here for additional details, including a list of the first participating school districts. This entry was posted in NewsBlog, Solar Schools and tagged Better Buildings Zero Energy Schools Accelerator, Discovery Elementary School in Arlington, Nebraskans for Solar, renewable energy & energy efficiency in schools, U.S. Department of Energy, zero energy schools on December 6, 2016 by Helen Deffenbacher.